My apartment sits on the border of Clinton Hill and Fort Greene in an area that is actually called Wallabout, and is one of the oldest neighborhoods in Brooklyn. My apartment, which is falling apart, is also probably one of the oldest buildings in Brooklyn. I can tell because it is falling apart. Gary Hattem, also a president of Deutsche Bank, does not know what a risk-taker is because he lives in an 1850s row house with a porch, most likely restored, full of period furniture, and one block closer to the G train than me. Gary has not lived in my falling-apartment or had to call my landlord at 8am on a Sunday. My sort-of ex-boyfriend told me that my apartment was “a study in decay.” The building is owned by an older Hasidic man who wanders around sometimes like he’s lost something on the sidewalk, and won’t shake my hand because I am a woman. My roommate is almost ten years older than me so when I moved in I assumed that he would assume most of the responsibility for apartment-related issues, two assumptions I should not have made. When I told him about the rat, he told me in an exaggerated voice that he “can’t deal with rodents” and (almost literally) locked himself in his room until I resolved the problem. I fear for my roommate when I am gone and he is forced to confront things on his own. So because my roommate is kind but useless, my other sometimes-roommate and best friend (who puts me together when I’m falling apart) brought the landlord in to our apartment one day. She saw him outside looking for something on the sidewalk again, and thought he should be looking for the rat instead. As she showed him that the rat in our kitchen had been stealing bananas from us, she also told him that we had been disinfecting surfaces and setting traps, waiting for him to call us back (the landlord, not the rat) for four days. I stood in the corner of the kitchen and mumbled that it was a health issue. After some pleadings he finally sent our building manager, (someone who we didn’t know existed), with a can of foam insulation to fill an eight-inch hole in the space between the counter and the wall (also known as the “dish graveyard”) and another one under the sink. After I found another half-eaten banana on the counter the next day, I called an exterminator on my own to fix and complete Patrick’s shoddy rat elimination job. He told me that the foam insulation could be chewed through in less than 15 minutes. I moved in to my falling-apartment after New York made my relationship fall apart. He found a much nicer Brooklyn apartment after we left our upper-east side apartment where we fell apart for what we thought would be the last time. We are still friends sometimes, and we compare stories about how “New York” it all is over brunches that inevitably fall apart by the third mimosa. He wonders when my study in decay will actually fall apart and I’ll move back home to California where things only fall apart during earthquakes if you haven’t had the foundation fortified. The truth is, I like my Wallabout, things-strewn-about apartment. I like the way it’s weird and needs to be renovated and how my landlord never fixes anything. I like the 19th-century high chair in the living room that everyone thinks is creepy, and the dinner plate with a portrait of the Eisenhowers on the wall that hangs next to the slanted wooden cabinets. I like how I assumed that the plate portrait was my roommate’s grandparents, and how it is oddly sloping downward as if one day they might just fall face-first onto the linoleum floor. I like all the mismatched dishes and mugs left behind and all the jars of fig jam my roommate made in Alabama over the summer, even though they take up a good chunk of our very small (decaying) dining table. One day I’ll miss 24-hour sushi from Mr. Coco’s and the 10 dollar almond butter that I buy when I feel like splurging on fancy groceries. I like how short-term it all feels, and how it sounds when I write about it, and I like that someday soon when I move out I’ll realize that it was all really just falling apart so I could put everything back together. When I was 8, my mom bought me worry dolls on a trip through Arizona. They are tiny dolls made out of some embroidery floss and other mystery materials in a little yellow box that are sold throughout the Southwest in souvenir shops. You’re supposed to set them out at night to take care of your “worries.” (They came with instructions). When I was little I took them very seriously. Most nights I would lay them out on my nightstand and tell each of them very specific things to fix. I was raised a pretty strict Catholic, so now looking back, it may have been some kind of silent rebellion against Catholic prayer, which I didn’t believe was working for me. Even when I was little I knew they weren’t actually going to solve my problems, just like I knew praying wasn’t actually going to solve my problems or larger problems in the world. But despite all that, I always had a small hope somewhere deep down that maybe it would work but I wasn’t supposed to know that it would. How easy would life be if we could tell our problems to some tiny little dolls who would fix them overnight for us? 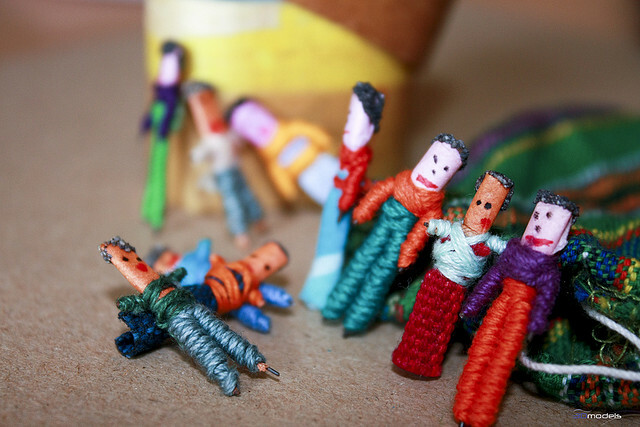 I stopped talking to the worry dolls except when I was having a really hard time with something – even in high school, I’m sure I pulled them out of the drawer in my nightstand a couple of times. I definitely never prayed outside of school or church except when I felt desperate, and even then it felt more like personal meditation rather than feeling like I was talking to someone. I wonder why those dolls always felt like more of a comfort that something so abstract as God. I think it was because they were so far removed from my own life and the things I was supposed to believe in that, in a way, I trusted them more. It was a higher power that wasn’t attached to a big church with gold statues, or mandatory days you had to believe in God, or mandatory prayers you had to recite. In that way, Catholicism eventually lost all mystery and all spirituality for me, even if subconsciously at first. It wasn’t something I could believe in at all. I have always felt like it is something we don’t know and can’t describe and can’t pray to that will save us. I ventured all the way out to Chelsea the other day to see a new exhibit at the Sean Kelly Gallery featuring the work of photographer Alec Soth. Soth interviewed and photographed men who live off the grid in Appalachia and remote parts of the Southwest. It became obvious from this exhibit, and after looking at the work on his website, that his photography seems to focus on this idea of space. Some of the most compelling pieces in his body of work involve an individual set into focus against a sparse background, whether it’s Karl Lagerfeld drenched in white at a Chanel show in Paris, or a man in the backwoods of Kentucky. This exhibit seems to focus on distance. Distance between the viewer in the gallery and the individuals in the photographs, distance between society and the men in the photographs, etc. Because this exhibit focused on retreating from society, it was especially bizarre to be thinking about this idea of “solitude” in New York, where it’s nearly impossible to feel truly alone. Sitting in a dark room with eight to ten others, I watched a film accompanying the exhibit, which documented Soth’s journey. His conversations with these hermits ran from funny to disturbing. The most upsetting part of the film was when Soth visits an obviously schizophrenic man in a completely dilapidated house, talking about how his meth-addled parents broke his arms. It’s always weird trying to imagine how anyone can survive without money or companionship or anything that we’re all “supposed” to have. Although, in the documentary, every one of the men that were interviewed had a TV in the background. The exhibit runs through March 11.